SMARThome.eu :: How not to forget that one little cable? 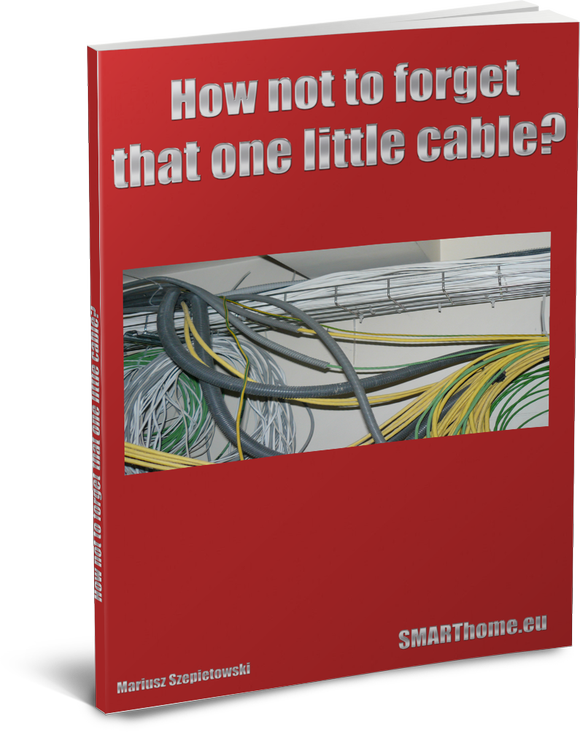 SMARThome.eu / Offer / Guidebooks / How not to forget that one little cable? Are you building or remodelling your house/flat? Do you know that of you forget a single cable you run the risk of having to break down the walls again and listen to your family complaining that you weren't provident enough and hadn't bought our list? Persons building a house or remodelling a flat, installation specialists and electrical installation designers often wonder which cables are required for which appliances in a house or flat. Certain matters are obvious (i. e. the lamps), but certain are very useful, though usually forgotten (i. e. lightning protection of the computer network, phone power outlet behind the cupboard in the hall). Browsing hundreds of pages of superficial information is time-consuming and ineffective. This can, however, be avoided. We had gathered information useful for investors, installation specialists and designers in our guide 'How not to forget that one little cable?'. Based on 12 years of experience in electrical, audio/video and smart home installations, as well as many publications and data, we have compiled a list of over 200 cables you need to include when designing your electric installation. Up to 25 000 EUR – this is its value in case you forget that 'one cable' and have to break open the walls again. 47 EUR – you only pay this much when buying the list 'How not to forget that one little cable?' and gaining access to this material any time and anywhere you need it! I am building my dream house, and I was wondering, which installations I should plan in it, so that I don't find out after painting and wallpapering the walls that I will need to introduce any changes. After quick calculations I had determined that I cannot afford a smart home, but I decided to make use of the guide 'How not to forget that one little cable?' because I wanted to have a list of all cabling installations which I might have at home. Apart from a few suggestions pertaining strictly to smart homes, I had used all the valuable notes. Hand on heart, I confess that had it not been for this - in any case thin - guide, I surely never would have thought about at least eight different cable installations, which are now under the plaster of my future living room. To sum up: A concise and to-the-point guide - perfect for a woman cherishing simplicity and sophisticated beauty. Now you can have all the most important information always at hand. Trust over 12 years of experience of SMARTech specialists. Order your list 'How not to forget that one little cable?' today for the special price of 47 EUR (the price rises with each new addition, present customers will receive all future updates, so it's worth buying quickly for a lower price). Yes, I want to order the e-book: How not to forget that one little cable? for the gross price of 47 EUR.